Well, some of you asked for photos of Bangkok - I can't say I have that many (I actually did work there - not much time to see the sights! 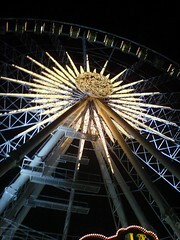 ), but here's one of the ferris wheel at Suan Lum Night Bazaar. that's a very nice picture! enjoy yourself in Bangkok. :) i'm very jealous. Just wondering what happened to your sox blog? ballsy - thanks v much! anon - thanks too! what showers? travis - don't worry, it'll be back - was laid low by travel + illness + work - but am recharged now.